With 40 years of experience, Coast is committed to making nursing as painless as possible so you can focus on the patient. It’s our job to ensure you really love yours. For 40 years, Coast has been a preferred nurse staffing agency in the Los Angeles area. We are market experts and the leading provider for travel nursing and per diem nursing jobs in Los Angeles and all of California. You’ll work with an established, family owned and operated business that consistently delivers on your expectations while delivering top notch customer service. Industry high pay issued weekly. Flexible Schedule. Full and part time nurse job opportunities! Ability to choose from multiple assignments – Per diem and travel nurse jobs both available! Partner with an established company that has a proven track record and reputation. Enhance your skills by working alongside top professionals in world class facilities. Get started quick! Pick up shifts within a week! Let's get to know each other! Learn more about how we can help you meet your career goals and strike the coveted work/life balance. Now, let's get the ball rolling! We'll work side by side with you to get your nurse profile ready for submission to nurse jobs. Start earning money! Explore new facilities and pick up nurse assignments when you want, where you want and completely at your pace. "I love that Coast gives me the freedom to choose my own schedule and always respects my days off. I get to work at top hospitals when I want to work and enjoy holidays, weekends and vacations with my friends and family. I've been with Coast for a long time and couldn't imagine a better work situation for me." "When I first moved to LA, I was unsure if I would be able to find steady work. Coast helped me find steady work at top hospitals within a week of my move. The onboarding process was professional and efficient. Coast helped me find steady work within a week of my move at top hospitals. I know they have my best interest in mind and go the extra mile for me. Coast welcomed me to the family and made the move to CA worth it. " "Of all the agencies I've worked for (and there have been a lot), Coast has been by far the best to work with. They offer diverse choices of assignments, hospitals, and pay top rates. The Coast team is considerate and there to assist with whatever I need at all hours of the day. " "I work full time at a hospital but wanted to supplement my income with per diem nurse assignments. I found Coast and am so impressed by their roster of hospitals. They work with facilities where I've always wanted to work. Coast has provided me the opportunity venture out of my comfort zone, meet new people and sharpen my skills. 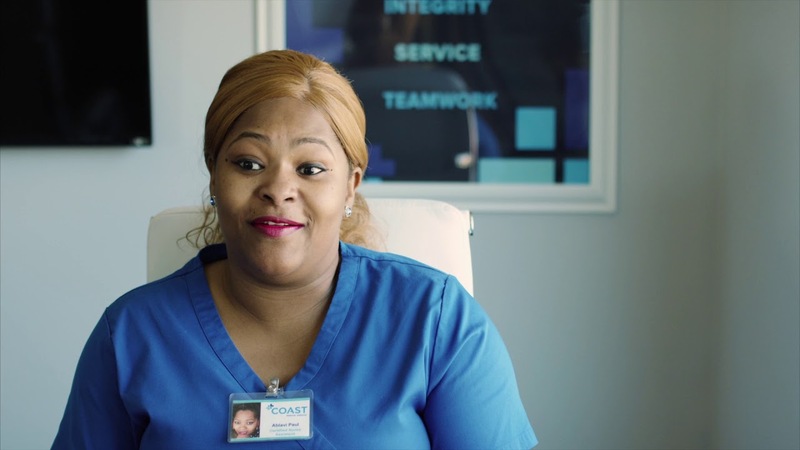 Working with Coast has made me a better nurse and I get paid well to do it! " "I was ready to give up per diem nursing and then I found Coast Medical Service. Coast is easy to work with, straightforward and they really care about me. They treat me like an individual and not just another number. They always find me work and they pay me accurately and timely. And they are getting better and better every year. Thank you Coast!! " "Coast always works hard to get me shifts when I want, even if it is at the last minute. They are dependable, knowledgeable and they deliver. Without Coast, I wouldn't have been able to pay my mortgage or put my kids through school. " Know someone who'd be a great fit for Coast? Refer a nurseto our nurse staffing agency and get paid! Contact us to learn more about our referral program. Set your own schedule and take control of your career. As a per diem nurse, you are free to choose the shifts and locations that suit your lifestyle and preferences. Shifts are offered daily according to hospital needs, and you’re never required to stick with specific hours or locations. If you’re looking for a nursing job that offers you total freedom and flexibility, per diem nursing may be the ideal path. Explore new cities while making a difference in people’s lives. As a travel nurse, you will head to a new location and work in a specific hospital for a set amount of time -- usually 13 weeks. As soon as your contract is complete, you can choose another location and begin the adventure anew. If you’re looking for a job that offers a stable schedule and enables you to satisfy your wanderlust, consider the benefits of travel nursing. Why Coast for hospitals and healthcare facilities? Coast Medical Service is a Joint Commission certified nurse staffing agency serving Southern California since 1979. We deliver quality service to make it easier for you to focus on patients. Have peace of mind knowing that a quality nurse is just a call away no matter the circumstance. 24/7 Availability. Call us anytime! Thousands of highly qualified and experienced nurses available immediately. Fast, efficient staffing with top notch service. 70% fill rate on same day nursing requests! A nurse staffing agency with a respected reputation and proven experience. Your success is important to us. Coast provides quality you can trust. Meet Your Trusted Nurse Staffing Team! Learn more about allied jobs with Coast Medical Service. LA's premier nurse staffing agency. Discover why Coast is the leading nurse staffing agency in Los Angeles. Sign up now to get our blog posts and stay current with industry news and Coast Medical updates.